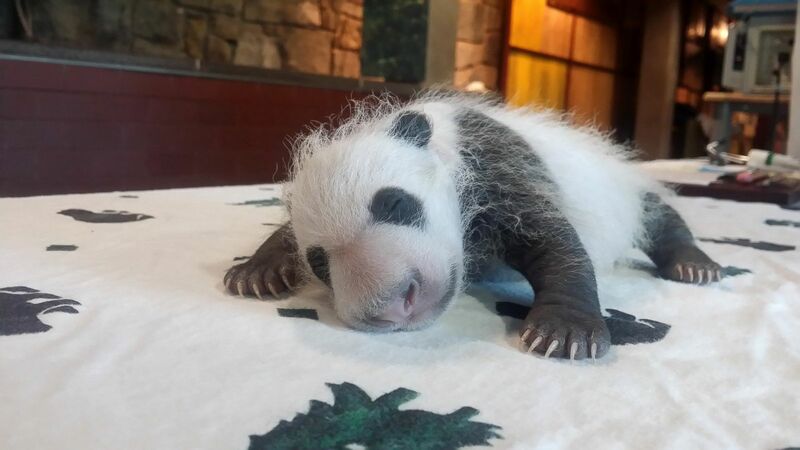 The tiny baby panda born at the National Zoo on August 22 is starting to look like his dad Tian Tian. At four weeks old, the baby now weighs two pounds and has developed markings in a similar pattern to those of his father. The little tyke still sleeps most of the day, which is normal for a panda of this age. In the next few weeks, he will start to open his eyes. You can follow the progress of the baby giant panda at the National Zoo’s website or with the hashtag #PandaStory on social media. Learn more about pandas at our giant panda facts page. This entry was posted in Animal Photos, Baby Animals and tagged giant panda, national zoo, smithsonian by admin. Bookmark the permalink. awe! so cute! who likes pandas?! me obviously but who else? I’m with you on pandas! They aren’t meant to DDDDDDDIIIIIIIIIIIIIIIIEEEEEEEEEEEEE!!!!!!!!!!!!!!!!!!!!!!!!!!!!!!!!!!!!!!!!!!!!!!!!!!!!!!!!!!!!!!!!!!!!!!! Any animal is adorable ???????????????????????????????? Any animal is amazing ???????????????????????????? Pandas are so CUTE ??????????????????? ?